It's been a long time. I've been very busy and the car has been sitting. I just haven't had time to touch anything and I needed something to kick me back into gear. 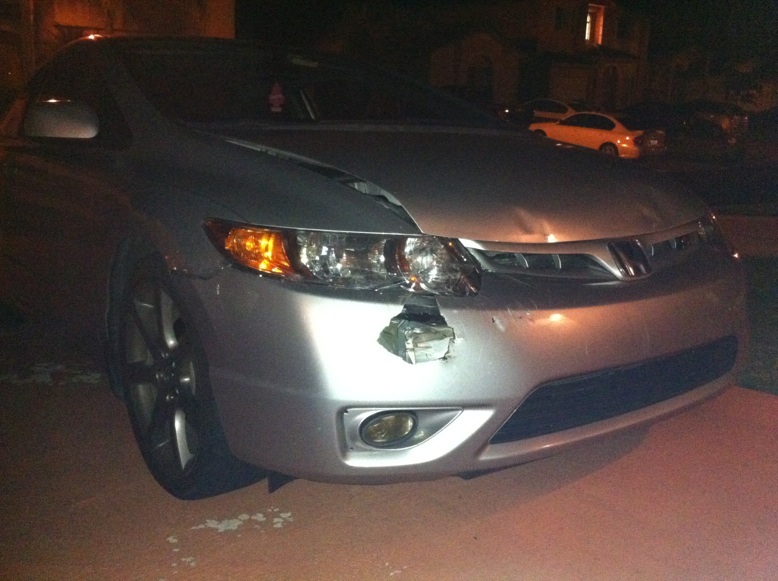 That happened when I rear ended a pick-up truck with a huge trailer hitch in my Honda. I had to visit some junk yards to see if I could find some of the parts to put the car back together. No luck at all, I ended up buying all of the parts online which means for now I have to hope that the packing tape holding the front of the car together holds up. 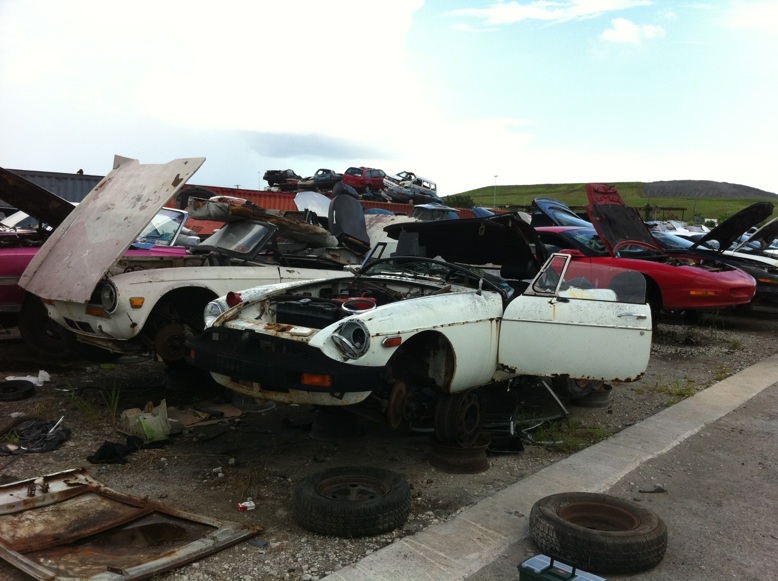 Since I struck out on Honda parts, I felt it would be irresponsible for me if I didn't at least poke around and see if there was an MGB or two lurking out there… Alas there was! 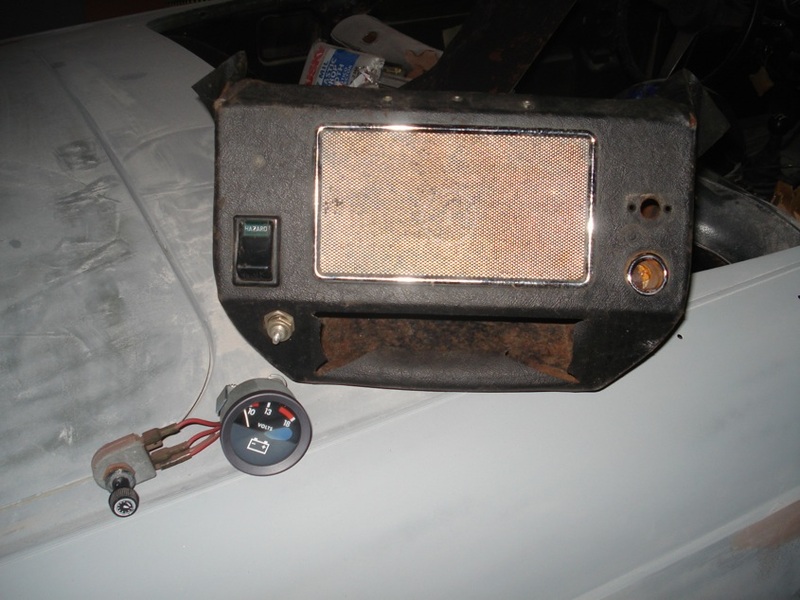 Here was a 1980 MGB, pretty well stripped but I got a hood prop, spare tire and glove box door. There wasn't much left worth having. Behind that was a white Triumph TR-6. The same cars from behind. Now I'm wondering why those taillights aren't in my garage too?? 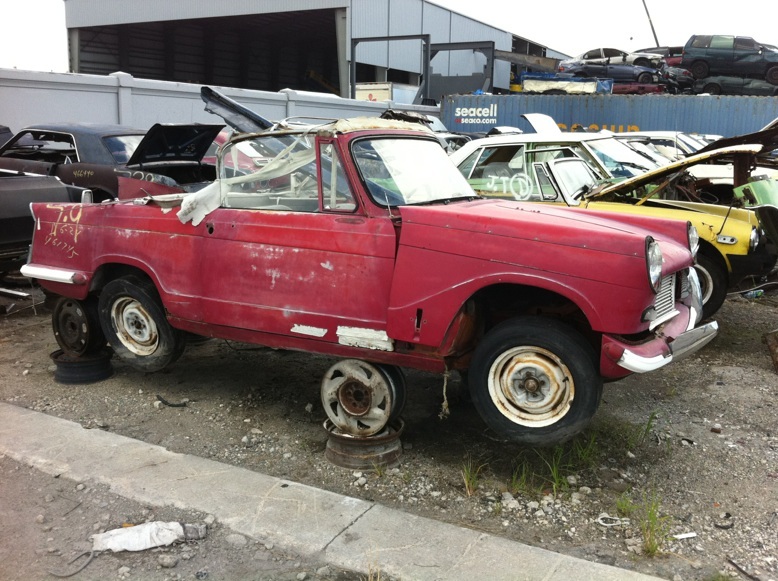 This car is a Triumph Herald. It has practically dissolved. 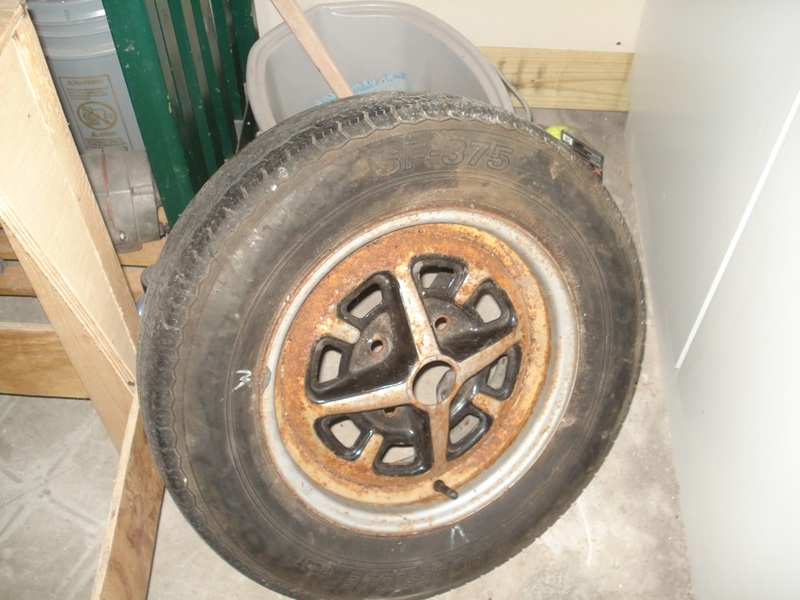 It's sitting like that, not because it's up on those wheel but because it's literally could not support it's own weight. You could see straight through it from every angle, the whole car is bending in half. 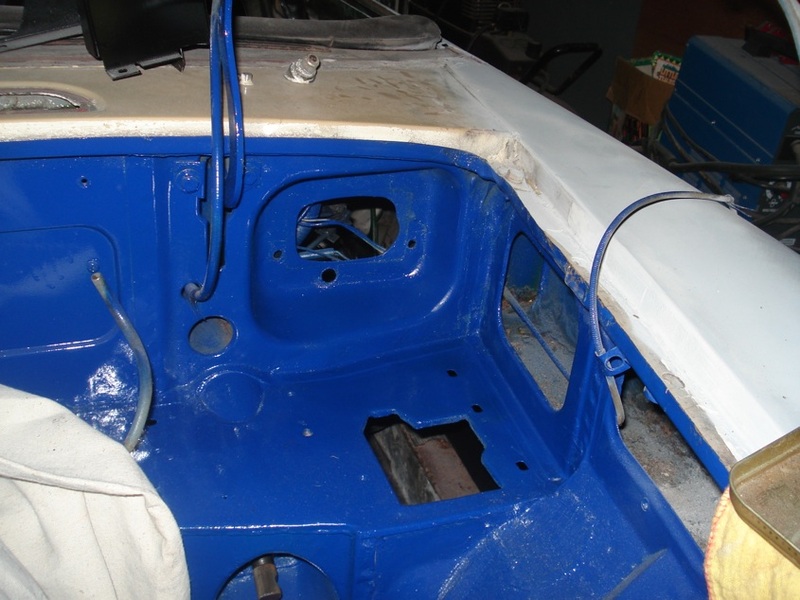 There were a lot of parts left on it, probably because it's one of very few left… Behind it is a later model MG Midget, also pretty well stripped. 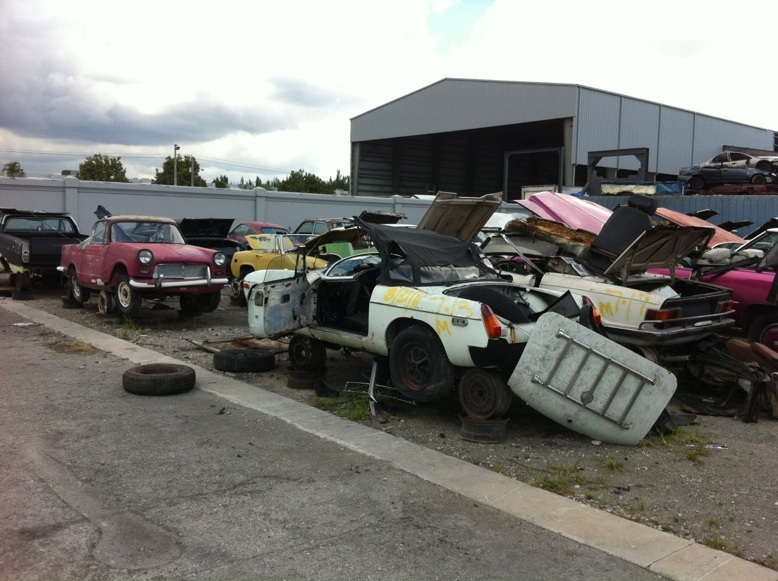 This yard also had a green '73 MGB up front with the import cars, this car was also pretty well stripped and what was left really wasn't worth having. There were some little odds and ends but not much left. Feeling motivated, and opportunistic, I decided that while I checked the air in our family car's tires, I would re-spray the area that got ruined with the brake fluid. I cleaned it thoroughly with acetone, lightly sanded the edges and re-sprayed it. You could never tell. I cleaned up the lower steering column on the wire wheel and slid it back in, cleaned the steering universal as well and gave it a shot of black heat paint. Next step will be to get that back in and tightened down to re-install the rack and pinion. Once that's done, the car can come off of the rollers and the exhaust and carbs can be re-installed. Brakes are ready to go back in too, for now I have decided not to replace the metal lines. I was doing it for appearance only, they are solid. Maybe later I will replace them but if I wait for every little thing, the car will never run again. I'm feeling motivated to move along even if it's in little, tiny steps.